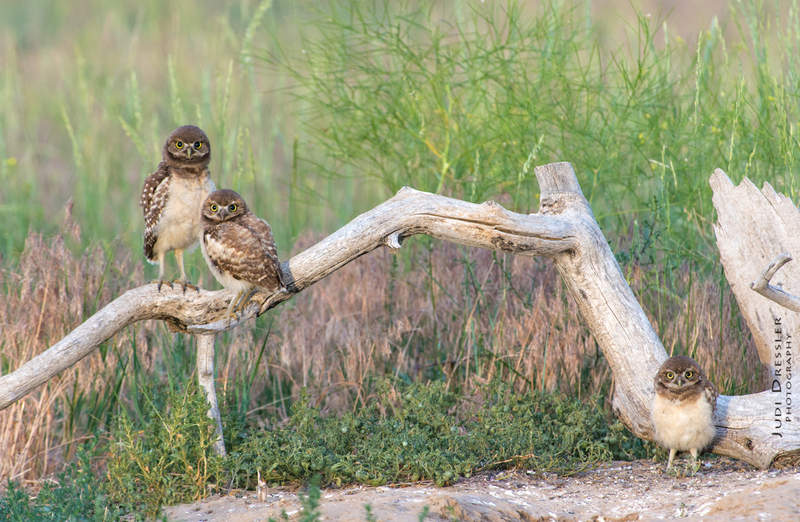 I got up at 4:30 a.m. to drive up to photograph these little Burrowing Owl babies. They are so entertaining! Here they are still a bit sleepy-looking since they just came out of the burrow and haven’t really woken up yet. They get way more active as the bugs get more active – it is very fun to watch them pounce on bugs – or – on anything that could maybe resemble a bug! Burrowing owls are born underground in burrows, often times these are burrows built by prairie dogs. They hunt crickets, grasshoppers, and other bugs, as well as small mammals such as mice, and small reptiles. Their numbers have declined sharply with human alteration of their habitat and the decline of prairie dogs and ground squirrels. This photo was taken near Greeley, Colorado, on July 15th, 2017, at 6:20 a.m.